Argh, that was so close! Instead of falling all the way to the .9700 handle as many of us had hoped, AUD/USD shot up and tested the .9800 handle instead! My adjusted stop loss at .9800 probably would’ve avoided getting hit last Friday, but it was no match for the weekend gap that we saw at the start of the week. Heck, the pair is even finding support at .9850 as I’m writing this! Oh well, it was a good idea at the time. But hey, let’s all give happy snaps to all those who profited from AUD/USD last week! You guys did great! As for me, I’m now thinking that I should’ve stuck to my trading resolutions and closed the trade before the weekend. Can’t blame a girl for trying though! Anybody out here who also took profit from the Aussie? How about those who held their trades open over the weekend? Now that the weekend is fast-approaching, I decided to make a few adjustments on my trade in order to manage my risk. 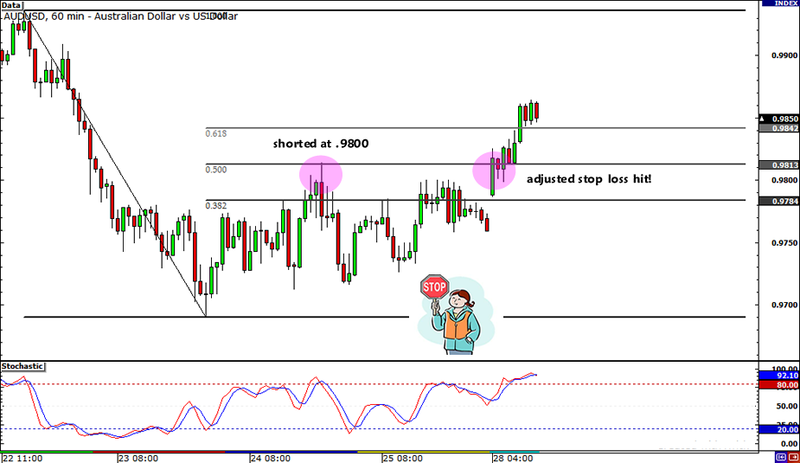 I moved my stop to my .9800 entry and cancel my short order at .9820 for a risk-free trade over the weekend. Although I mentioned in my trading resolutions that I wouldn’t hold any trades open over the weekend, I just thought I’d hold on to this trade since I believe that fundamentals still haven’t changed and that AUD/USD has enough reason to head further south. The adjustments I made would act as a good compromise, wouldn’t they? Right now, I’m up by roughly 70 pips and AUD/USD seems to be forming a bearish pennant, which is hinting at a potential breakdown. That means I’m close to a 1:1 return on my open trade! It’s too bad it didn’t reach as high as my other short order at .9820 and I could tell from the comments below that some of my comdoll buddies were watching that level, too. Stay tuned for my updates though! Who knows? This pair just might dip to my PT during today’s U.S. session. I’m keeping my fingers crossed! So far so good! 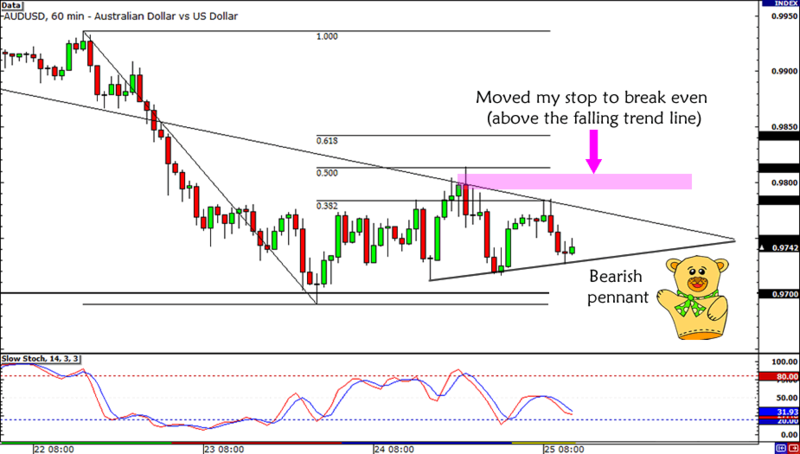 Just when I thought that I had missed AUD/USD’s price action, the pair went up to trigger my first position! AUD/USD dropped to the .9710 area during the early London session at the release of the euro zone’s weak economic data, but the pair slowly made its way back up as a bit of optimism hit the markets. Unfortunately, the worse-than-expected durable goods data from the U.S. is weighing on risk sentiment. Will the report set the tone for risk sentiment for the rest of the day? The pair found resistance almost right at my .9800 entry price, and it looks like an overbought Stochastic signal is also supporting a short trade. I’ll be closely watching my trade in case it breaks the falling trend line on the 1-hour chart. But if price action goes our way, then I’m planning on either setting my stop to break even or taking profit at .9700. Anyone here in this trade with me? Maybe you could give me advice on whether I should add another 0.25% to my position since it isn’t likely that the pair would touch my second order at .9820. What do you think? After trading USD/CAD and NZD/USD ranges for the longest time, I’m finally giving AUD/USD a shot! As we all know, the Aussie has been weakening against the Greenback since the start of the month thanks to weak commodities and growth concerns in the euro zone. AUD/USD is down 5.69% as of writing and even touched new 2012 lows yesterday! I’m thinking that I can still jump in AUD/USD’s downtrend since nothing much has changed in Australia‘s fundamental landscape. For one, concerns on Greece and the euro zone are likely to escalate since we’re still not seeing concrete action from the European leaders. Then, China’s HSBC PMI signaled more contraction in the manufacturing industry at 48.7 (vs. 49.3) in May while gold prices are still near its steep lows. On the technical side, I’m looking to jump in on the trend by entering at the .9800 level. That area not only coincides with the falling trend line, but it’s also lining up with the 38.2% and 50% Fib levels. Aside from that, stochastic is also in the oversold territory! I’m not sure the pair will retrace all the way up to the 50% Fib, so I plan on scaling in my positions. I put 0.25% on the .9800 major psychological handle and another at .9820 in case we see comdoll strength before the U.S. session. I set my first PT at yesterday’s lows (.9700 area) and my stop loss at around .9875. 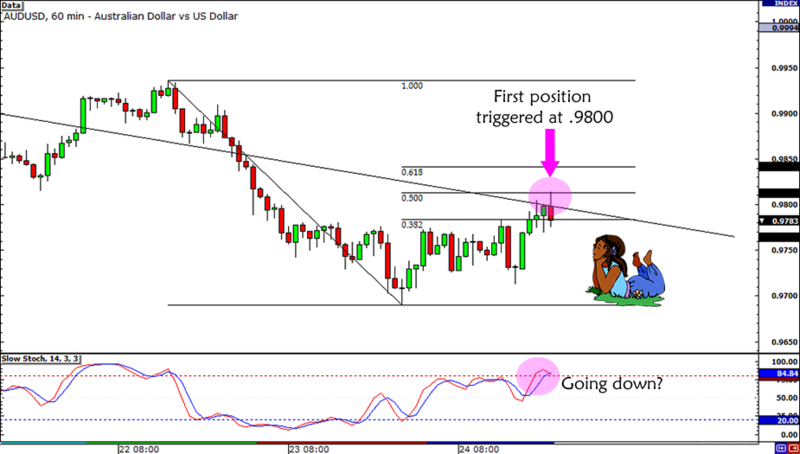 Short AUD/USD at .9800 and .9820, stop loss at .9857, target at .9700. Plannin’ on trading the setup with me? Make sure you read our risk disclosure! What do you think of my setup? Is waiting for a retracement a good idea, or should I take hints from my previous trades and just jump in? You know where to catch me!